Ukrainian team ranks third in the medal standings. 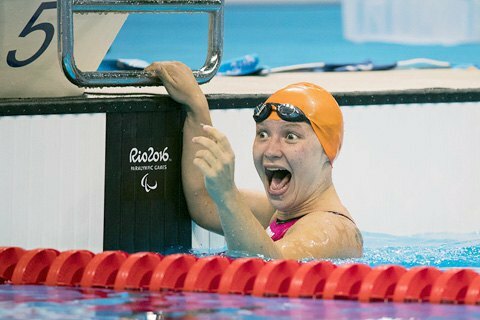 Ukrainian team after the fourth competition day of the Paralympic Games in Rio de Janeiro won 12 medals: six gold, three silver and three bronze, the National Olympic Committee reported 12 September on Facebook. The champions are Laila Adzhametova (running at 100 m), Roman Polyanskiy (rowing), Yelizaveta Mereshko (swimming 100m breaststroke, Oleksiy Fedin (swimming 100m breaststroke), Denys Dubrov (swimming 200m), Natalia Cosmina ( table tennis). The second best were Zoya Yevsey (throwing maces), Victoria Savtsova (swimming 100m breaststroke), and Maxym Kripak (swimming 200 m). Bronze medals went to Dmytro Prudnikov (long jump), Dmytro Vanzenko (swimming 200m), Serhiy Palamarchuk (swimming 200 m freestyle). At the end of the fourth day, Ukraine ranked third in the medal standings of the Paralympics with 49 medals - 18 gold, 13 silver and 18 bronze. The leader in the medal standings is China (39 gold medals), followed by United Kingdom (23). Government pledges to cover up to 85% of utility bills.